Like we’ve said so many times, arcade games are our favourite types of games. They are simple, yet so fun to play. Today, as our Arcade Game of the Week, we’re sharing with you an amazing and tap to jump game called Fruity Jump. Although it was already mentioned here on Intellectuapp, we simply couldn’t resist from reviewing it again. Let’s see what this game is all about and why we loved it so much. What is Fruity Jump all about? 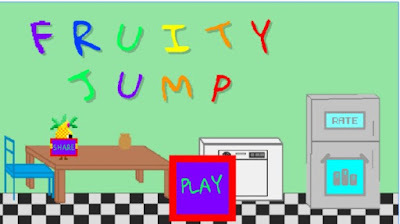 Fruity Jump is developed for both android and IOS platform by students in the 8th grade of the Magnolia Science Academy in San Diego. This arcade tap game is suitable for every age, highly fun and addictive with an easy to play gameplay. On this game, players will get to enjoy the amazing colorful design with many fruits for jumping and the amusing sound effects every time they tap on the screen to jump. The players are offered to have fun in one fruity world while they are testing their fast reactions and tapping skills to win the game and beat the boss. On this arcade game with tapping gameplay, all the players will have fun jumping and tapping in the world of fruits, challenging their skills and offering them endless fun, keeping them addicted to the gameplay. The player on this arcade has one simple task he needs to tap on the screen to jump the fruits on objects in the kitchen while avoiding the obstacles on the way. Also the users can tap twice to double jump the fruits. The main goal is to beat the boss by staying longer in the game and reacting fast with tapping on fruits and jumping. On this fun arcade, players will have the chance to test their fast reactions and always have fun no matter if they play the game for the first time or the tenth. Players will be amused of the fruity world with jumping fruits while beating the boss and winning the tapping game.